When can the insurance company stop your NC Workers' Comp checks? When can the insurance company stop your NC Workers' Comp checks? Injured workers who are determined by their authorized treating physician to be disabled because of their workplace injury should receive disability payments paid by their employer or their employer’s insurance company. These disability benefits are intended to replace the employee’s wages while they are not able to work. Not surprisingly injured workers are frequently very worried about their workers’ comp checks being stopped. This is particularly true since NC Workers’ Comp Checks are only two-thirds of the employee’s pre-injury average weekly wage to start with. In an accepted case, an employer can automatically cut off an injured worker’s Temporary Total Disability benefits when the employee returns to work with the employer of injury or any other employer. If the worker has returned to work at lower pay the worker may be entitled to Temporary Partial Disability payments to help make up the difference in wages. An employer can also terminate an employee’s NC workers’ comp checks when the employee dies, although the employee’s family or dependents might be entitled to file a claim for workers’ comp death benefits, if the death is related to the workplace injury or disease. When an employer wants to terminate or suspend an injured worker’s disability benefits for a reason other than return to work or death, the employer must file a Form 24 Application to Terminate or Suspend Payment of Compensation. The Form 24 must state the reason the employer is seeking to stop Plaintiff’s disability checks. The Form 24 should be supported with any available documentation. The employer must provide the Form 24 to the employee and file a copy with the North Carolina Industrial commission. An injured worker has fourteen days to object to the employer’s attempt to terminate the employee’s NC workers’ comp checks. If the employee fails to respond within 14 days the Industrial Commission can order the benefits stopped. If the employee objects to the termination of benefits, the Industrial Commission will hold a informal telephonic hearing on the termination of benefits. During the telephonic hearing both parties may present evidence and argue their positions on the issue. After the hearing the Industrial Commission will issue an order granting or denying the motion to stop benefits, or directing that the issue be scheduled for a full, formal hearing before the Industrial Commission. The most common reason for an insurance company to try to stop an injured worker’s NC workers’ comp checks is because they believe the worker is no longer disabled because of the workplace injury. If the authorized treating physican releases an injured worker to full duty work without restrictions then the employer will almost certainly file a Form 24. Other grounds for the employer to attempt to cut off an injured worker’s disability payments include a refusal to accept suitable employment, or refusal to cooperate with medical treatment or vocational rehabilitation. Sometimes the employer is simply trying to gain advantage before attempting to settle the workers’ comp case. An injured worker who has received a Form 24 application to terminate benefits should immediately contact a North Carolina workers’ compensation attorney. Time is important in this situation so do not delay. A NC workers’ comp lawyer can help determine whether to fight the employer’s effort to terminate disability payments, and if so help decide the best way to do so. 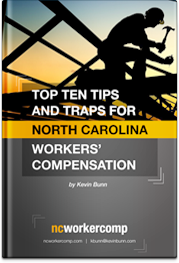 Kevin Bunn is a Board Certified Expert in NC Workers’ Compensation Law. Kevin’s office is in Cary, North Carolina, convenient to the North Carolina Industrial Commission in Raleigh. Please call or email for your free consultation with a NC workers’ comp lawyer.